This little blog here operates out of a shoebox kitchen with limited work space and almost zero natural light. We’ve got two ovens, neither of them any good. One is a small electric thing that is ok for baking cookies but mostly used for making toast. On the other side is a gas oven with temperature settings of hot and really darn hot that I use for roasting vegetables and burning granola. Matt says when we’re real grown ups we’ll have an extra gas tank handy, but for now we can only hope that we run out of gas between 9am and 7pm and not between 12pm and 3pm and cross our fingers never on a Sunday (the perks of living in a small french town!). Well, these two almost grown ups were making dinner last week somewhere around 8pm and we ran out of gas with some half roasted vegetables in the oven and a pot of par boiled millet on the stove and a very hungry Jodi cursing in their tiny kitchen. Sometimes I just wish we had the perfect house and our gas flowed out of the wall like normal people and we could afford to heat our room above freezing temperatures. 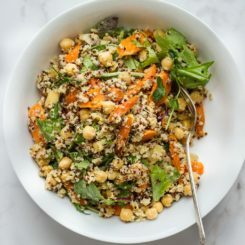 But then, we were outside on the deck, finishing the millet with our camping equipment and eating the vegetables al dente and drinking tea out of a thermos and I realized that I could never have it any other way. This imperfect, almost grown up life. A few years in this house now and I’ve managed to turn out some good meals, and some pretty horrible ones too, but so far no one has turned down a dinner invite (that I know of!). If my late twenties have taught me anything it’s that life is one big mess and we have control over very little of it. So maybe one day I’ll have a big kitchen with an oven (singular) that does all the jobs, maybe I won’t. I guess being a real grown up means ya just gotta roll with it and keep camping gear handy. Also, a love of food runs in the family and my sister is starting a new career as a holistic nutritionist. I was getting used to the idea of having her as my private on-call nutritionist but I suppose I can share her with all of you now. 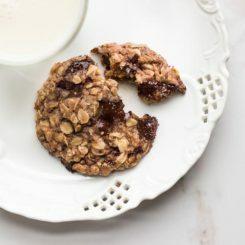 Check out her new site for all things nutrition, and perhaps and little recipe or two as well. So darn proud. Double also, it’s the Saveur food blog awards and it’s such a great chance to nominate your favorite sites. So many inspiring food blogs out there it’s nice give a little love. Let your voice (and tummies) be heard! Vote here. 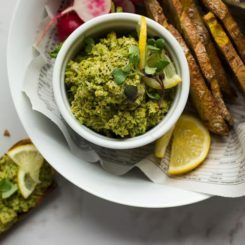 This has been my go-to dip when having people over for dinner lately, it’s rather quick and simple to make, and is followed ever so nicely by this. 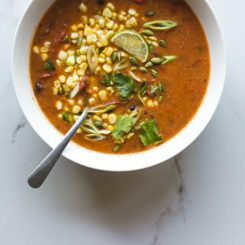 If you’re in a pinch, you can use store bought red peppers instead. 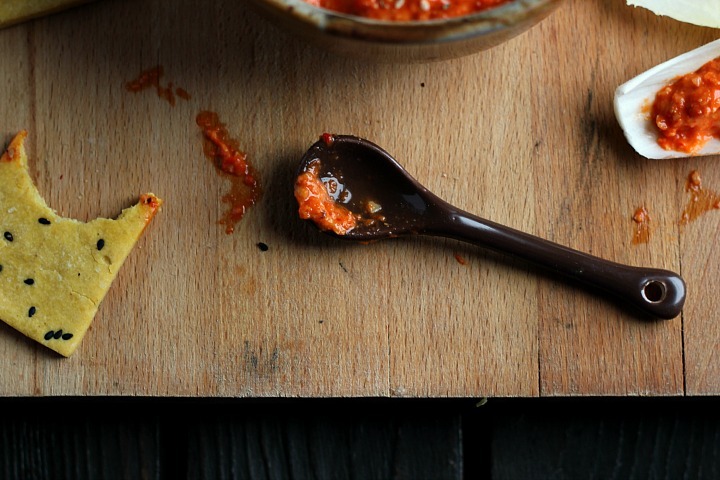 I used dried chili flakes here, but it you have a fresh chili hanging around in the fridge by all means use that. 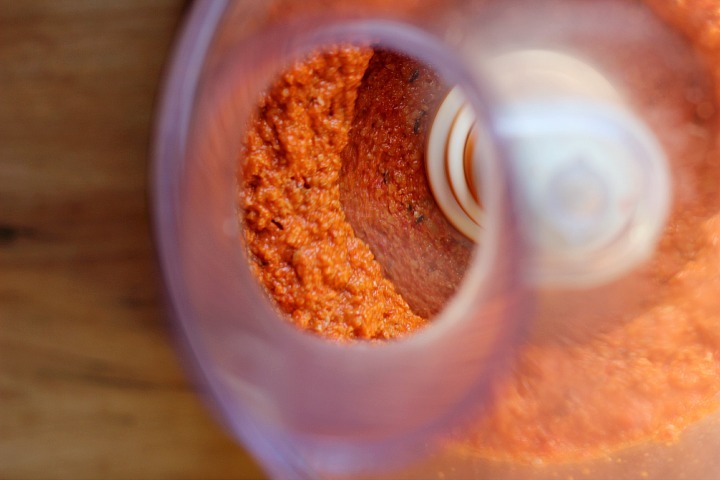 Don’t worry if the dip looks a little liquid-y in the food processor, it thickens while it sits in the fridge as the almonds soak up some of the pepper juice, or something totally scientific like that. Makes 2 (ish) cups. Vegan + Gluten Free. 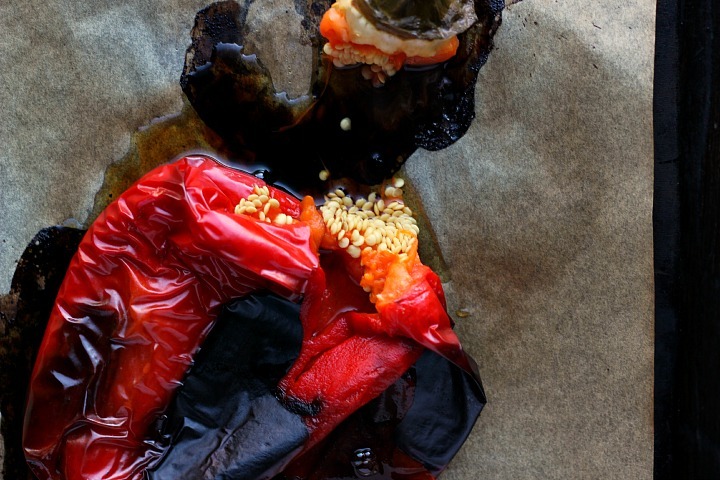 Preheat the oven to 425 F / 220 C and place the whole peppers on a rimmed baking sheet covered in parchment and place in the oven for 30 to 40 minutes, until the skins are completely wrinkled and the peppers are charred, turning them twice during roasting. Remove the pan from the oven and immediately cover it tightly with aluminum foil. Set aside for 30 minutes or so, until the peppers are cool enough to handle. Remove the stem and seeds and peel off the skins. 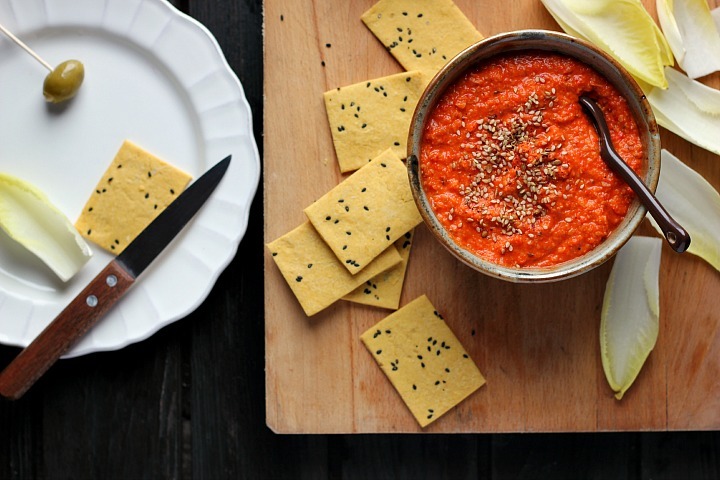 Give peppers a rough chop and place into the bowl of a food processor. 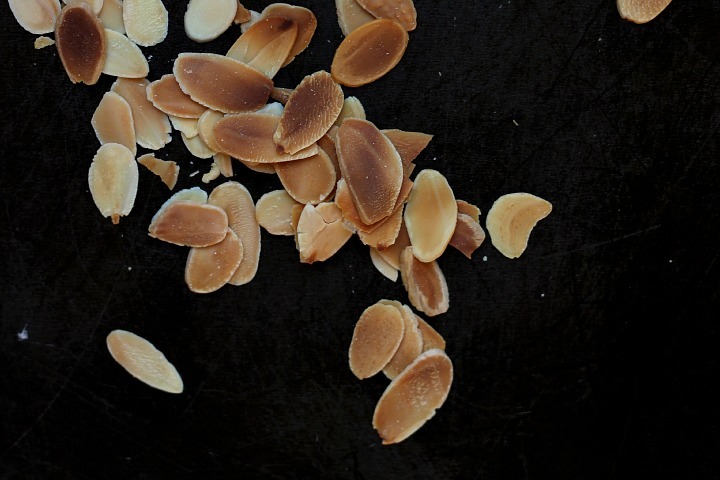 While the peppers are roasting, toast the almonds in a heavy bottomed skillet until brown and fragrant, let cool then add the almonds to the food processor. Pulse peppers and almonds together until roughly combined, then add remaining ingredients and blend to combine. Taste and adjust seasoning as needed. 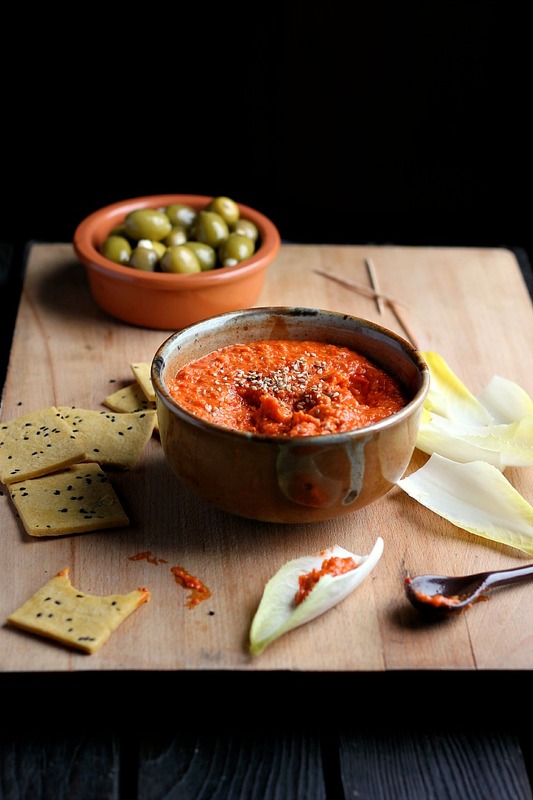 Place dip in the fridge to set for at least 30 minutes before serving. Will keep in the fridge for a few days in a sealed container. Ps. Your sis’s site is awesome, congrats to her! I’m looking for a nutritionist right now, too bad she isn’t in my neck of the woods! Bonus for having her on call yourself though, how cool! Jessie, my sister is just the coolest! You should set up a skype date with her ;) (haha – shameless family promotion?) We are soon leaving this little french kitchen and I actually think I’m going miss it and all it’s quirks – I’m just starting to figure them all out! Thank you for stopping by, your comments always make me smile :) ps. 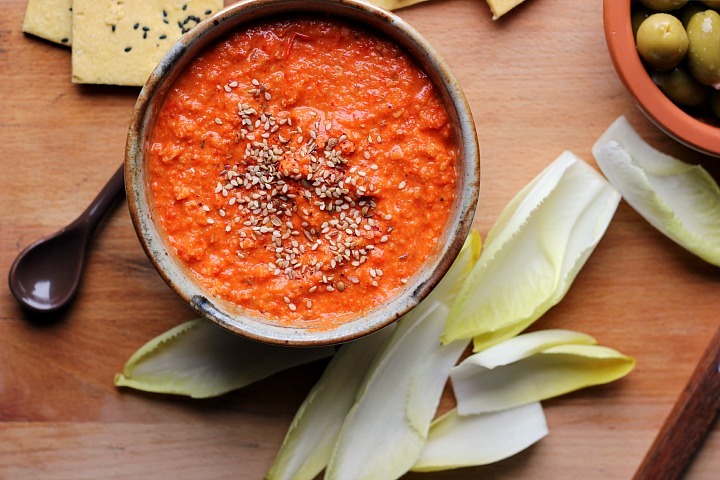 harissa for life. My parents have a house in the south of France and we used to have a similar gas oven/hob – we we always running out of gas at the most inconvenient times (like when we were trying to cook a leg of lamb) and would have to pop round to our neighbour’s house to finish it off there! They re-did their kitchen a couple of years ago and moved to an electric oven – life is so much easier now! 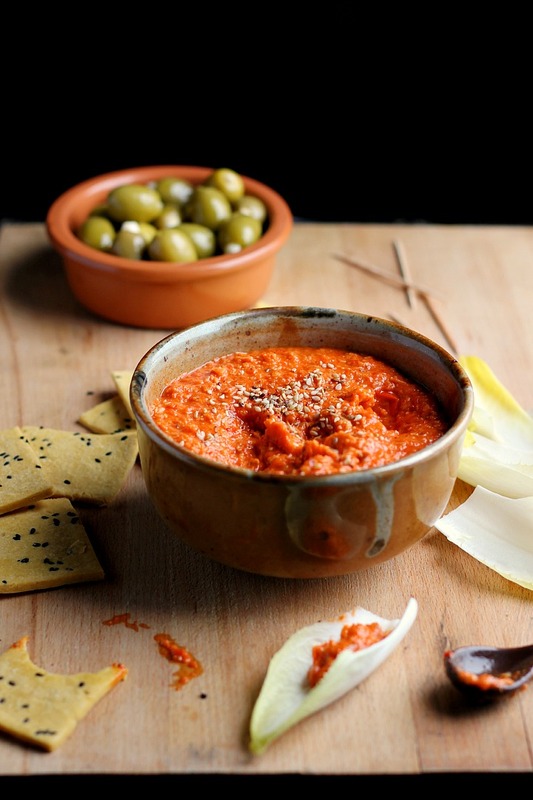 This dip sounds so good – love these flavours so much and the colour is just the best. When I was living in Scotland, natural light was a huge problem for me and food photos because the sun would set so early during the winter! But then summer would always come along and save the day with 10pm sunset times. 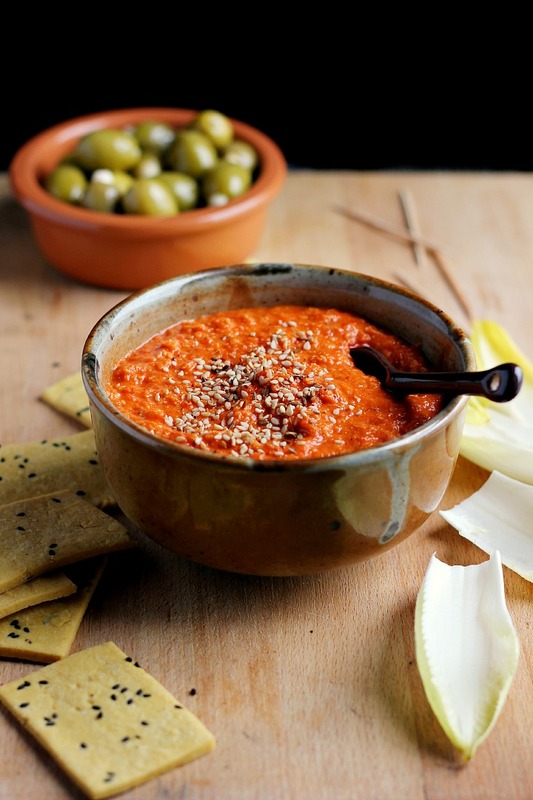 I’m normally not one for roast red pepper flavoured things, but this dip sounds super duper tasty! Also, camping gear is the best. When my boyfriend and I were together, we cooked almost exclusively with his camping pots instead of buying more pots because they were just so easy to work with! This sounds wonderful!! 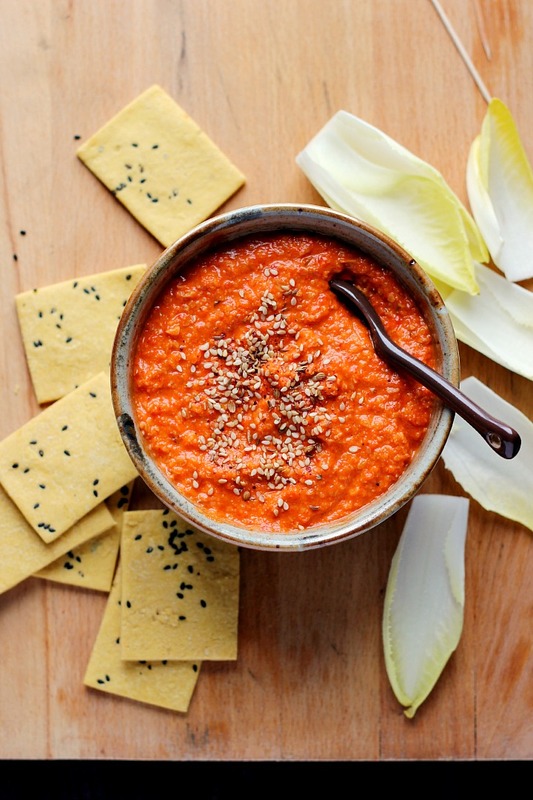 I love roasted red pepper everything. By the looks of all your pictures, you do a fantastic job with the light and space! Your photos are beautiful! 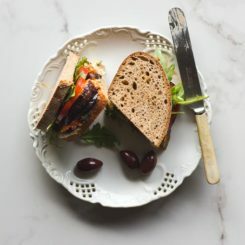 I am new to your blog and so far I really love what I see! 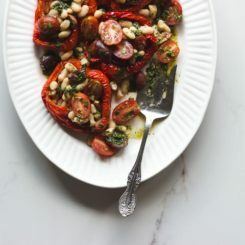 Great recipes, and wonderful photos. You mentioned that you have almost new natural light in your house. Does that mean these photos were taken in artificial light? I have never used it, but these look good! Hi Kristie! Thank you so much! Yes indeed we get almost no natural light during the winter, but I still manage find a little light in front of one of our windows. I have to re-arrange the house a bit but it works for now! I have never used artificial light either, I think I like the challenge of battling with the sun! Oh thank you Lily! Thats so sweet!